numbers written on panels behind the trim. This LHD vehicle when new, was first UK registered in Coventry during 1970 then exported to New York, ending up in California. It was repatriated and used in the UK during the early 90’s and barn stored for almost 23 years. 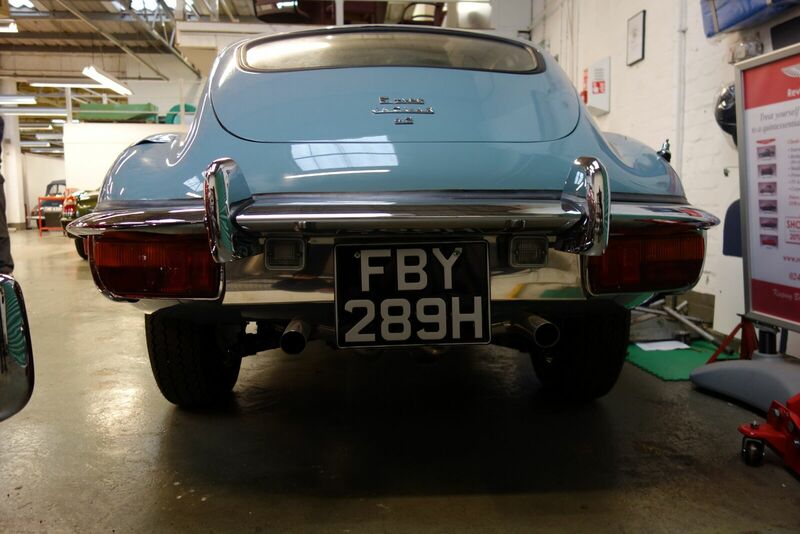 Incredibly well preserved, this E-type only required a new boot floor and fuel tank. Every other panel from the sills to the bonnet are totally original and only required a small amount of work (including lead loading). 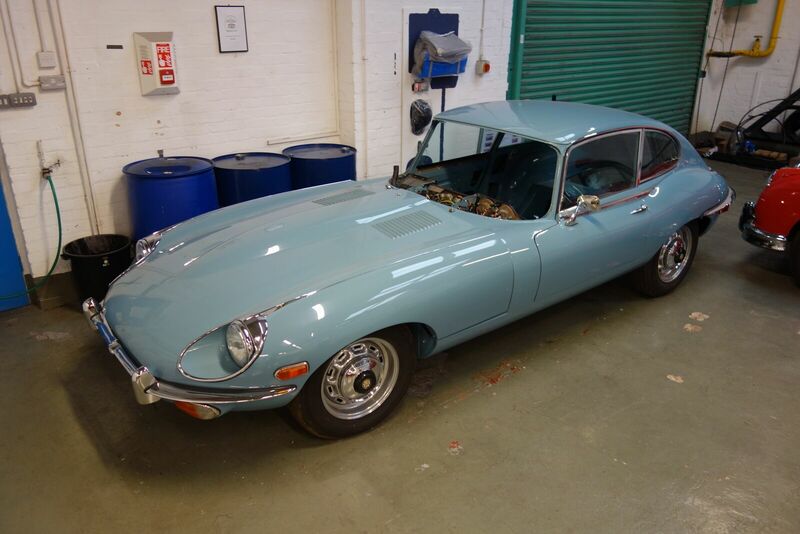 The car has been painted back to its original factory pale blue. Black with black leather seats. Metal work has been repainted internally, new carpet throughout, with re-trimmed front/rear leather seats and interior panels. 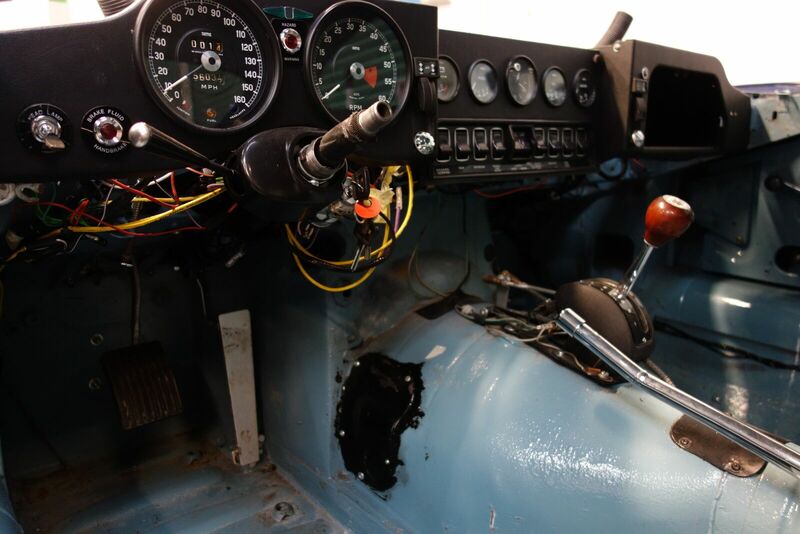 Moto-lita wood rim steering wheel, new Securon inertia seat belts and refurbished dashboard with some new instrumentation, refurbished switches/controls, dash-top and perfect original crash rail. This extremely rare option has been painstakingly restored taking over 30 hours of work. The original troublesome froststat and switchgear has been reworked. The AC compressor and condenser will be new Sandown type units connected to refurbished original pipework and a N.O.S receiver drier. Completely stripped and refurbished, restored to UK spec triple SU carbs / manifold, ignition and radiator. Stainless steel exhaust and all new pipework. Reconditioned original Borg warner gearbox and completely refurbished differential/axle. Totally overhauled with new bushes, seals and paint work. Original refurbished front calipers and new rear calipers with copper brake lines. New discs pads and bearings. Overhauled original factory steering rack with new tie rods and ends. The original wheels have been refurbished with new tyres. Vehicle has been comprehensively rust proofed using 3m shutz, stonechip and many litres of Wax-oil before reassembly. 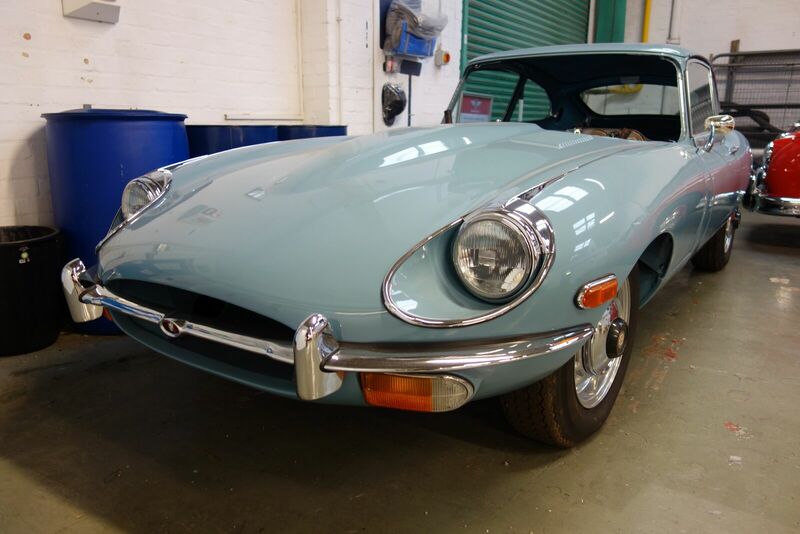 This car has been stripped to a bare shell with frames off, you will not find a better specified more original S2 E-type at this price level, with this history and attention to details. Doors glide shut, everything works and the drive is perfect. 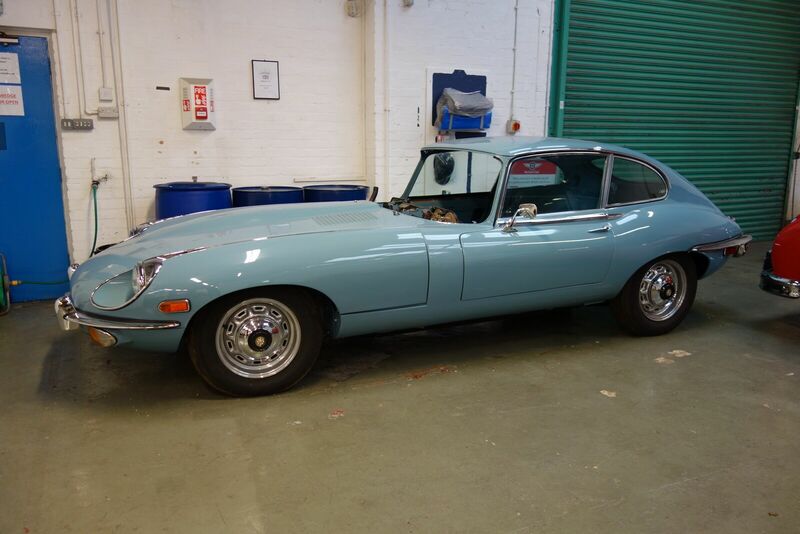 1x Heritage certificate: Engine, gearbox, body & chassis numbers all match and it shows date of first registration in Coventry. 1x V5 document (Car is Sorned) original US registration paperwork.